A senior Iranian official says Iran will launch a second uranium enrichment facility later this month at an underground site that is well protected from potential air strikes by nations opposed to the Iranian nuclear program. The head of Iran's Atomic Energy Organization Fereidoun Abbasi said late Saturday the injection of uranium gas into centrifuges at the Fordo enrichment facility will begin before February 1. Iran revealed the existence of the plant to the U.N. nuclear agency in 2009. It is located beneath a mountain near the Shi'ite holy city of Qom. Western powers suspect Iran's enrichment activities are aimed at developing the capability to produce nuclear weapons. Iran says its nuclear program is designed only to generate electricity and material for medical research. The United States and its ally Israel have not ruled out military action to stop Iran from developing nuclear weapons. Israel sees a nuclear-armed Iran as a threat to the Jewish state's existence. U.S. Defense Secretary Leon Panetta says Iran's nuclear program has not progressed to the stage of building a nuclear bomb. But in an interview with U.S. television network CBS broadcast on Sunday, Panetta says that if Iranian leaders take that final step, the United States will stop them. Panetta says the United States will continue what he called a "responsible" approach of putting diplomatic and economic pressure on Iran to abstain from developing nuclear weapons. He also advised Israel not to take unilateral action against Iran, saying a "better approach" is to "work together" with the United States on the issue. Iran's first enrichment facility in the central city of Natanz has been enriching uranium up to a fissile purity of 20 percent since last year. Weapons-grade uranium is usually enriched to a level of 90 percent. 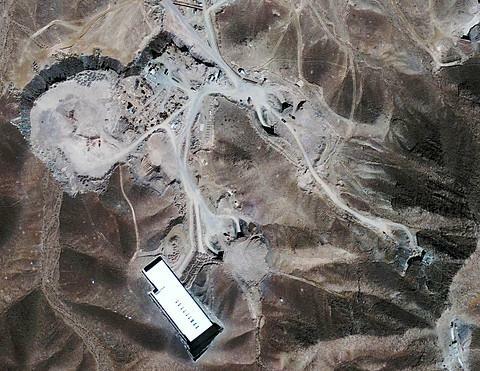 Iran has spent months preparing to move its higher-grade enrichment from the above ground plant at Natanz to the underground Fordo complex. An Iranian newspaper allied to the country's supreme leader reported Sunday that Iran already has begun enrichment at Fordo at a time of "heightened enemy threats." There was no independent confirmation of the report in the Kayhan daily. In the same interview on CBS, U.S. Joint Chiefs of Staff Chairman General Martin Dempsey said the United States will "defeat" any attempt by Iran to block the Strait of Hormuz, a vital shipping lane for global oil supplies. Iranian officials have threatened to close the strait if Western powers block Iranian oil exports as part of a sanctions campaign against Tehran. General Dempsey said Iran has the capability to block the strait "for a period of time," but said such a move would be "intolerable" to the United States and the world and would draw a U.S. military response.